Tribal art gathered by three travelers — U.S. Ambassador, Nicholas M. Salgo; the artist, Neltje; and the educator, Mary Jane Edwards — during their trips to Papua New Guinea are featured in this exhibition. All of the objects have a story to tell, not just about their origin and their makers, but also about the people who acquired them on their travels. 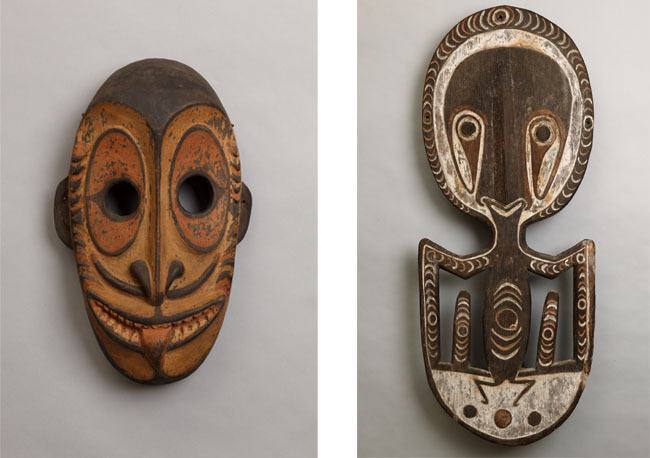 The more than 80 objects in the exhibition are primarily from the regions of the Sepik and Maprik Rivers and include ancestral and mythological figures, masks, war shields, drums, canoe prows, skull racks and items of personal adornment. The exhibition is drawn in part from the recently gifted collection from The Salgo Trust for Education, originally acquired by the late Hungarian-American financier and diplomat, Nicolas M. Salgo while on a trip to New Guinea with famed architect I.M. Pei in the early 1970s. Expanding the exhibition are objects lent by Wyoming artist Neltje and the former head of the UW Art Department and executive director of Jentel, Mary Jane Edwards, who visited Papua New Guinea in 2006. Curated by Barbara Stone, independent curator. Click here for the Journeys along the Sepik River cell phone audio tour. Sponsored by Rocky Mountain Power with additional support from the Erma Hill Endowment for the Art Museum, FMC Corporation and the National Advisory Board of the UW Art Museum. Curator Barbara Stone along with Neltje and Mary Jane Edwards discuss the exhibition, Journeys along the Sepik River: Tribal Art from Papua New Guinea.